Home » Broadsides Discussion Forum » Broadsides Discussion Forum » Canadian Marines and Amphibious Ships » Who scuttled the “Big Honking Ship”? Recently, the Globe and Mail reported that the Conservative government has revised its expectations of success in Kandahar. Knowing that the situation on the ground in Regional Command South is ever changing and our military commitment there is evidently slated to end in 2011, such a policy shift may indeed prove to be a politically good one. What does not seem to tally, however, is the absence in Mr. Harper's government's Canada First Defence Strategy of any provision for the Canadian Forces Expeditionary Command (CEFCOM) that would enable it to fully discharge its intended role through the acquisition of a capability to field a Standing Contingency Task Force (SCTF). This omission is puzzling, considering that Conservative party defence policy under his leadership had long recognized the need for strategic sea and air mobility of rapid reaction forces by heavy airlift and amphibious ships. The recent purchase of four C-17 Globemaster III aircraft adequately addresses the former but the latter requirement remains unsatisfied. If correct, the reduction of CEFCOM's mission capability arising from the abandonment of prior notions to field a SCTF embodying an amphibious capability is seen to be a most worrisome turn of events, given that in 2005 the government of the day's intention was to increase the deployability of Canada's forces to trouble spots around the world through the creation of such a force. Without sea lift amphibious carriers for the delivery of combat and logistic support of our ground forces in security and humanitarian missions CEFCOM will remain a largely hollow command unable to field rapid response and contingency task forces. It is noteworthy that in a speech delivered at the April 29, 2008 Navy Summit, Honourary Navy Captain, Conservative Senator Hugh D. Segal, boldly advocated the addition of an entirely new and global maritime capability in the form of amphibious ships and said "we need to be able to have it in more than one theatre at a time." Later, the esteemed military historian, Dr. Jack Granatstein wrote and expanded upon Senator Segal's suggestion. "Our sailors must be able to transport and support Canadian troops operating overseas, sometimes perhaps on a hostile shore. The presently planned three Joint Support Ships can't do this; four might be able to manage, but six would be better, along with what General Rick Hillier called "a big honking ship" that could transport four to six helicopters and a battalion-sized expeditionary force. Such ships can also do humanitarian work -in tsunami-hit Indonesia, for example- that we can scarcely tackle today. "He said. And he was right. Similar viewpoints addressing the need for a Canadian amphibious capability were also recently expressed in the Conference of Defence Associations Institute's 2008 Vimy Paper by the former commander of our Pacific Fleet, Rear Admiral (Ret'd) Roger Girouard and Rear Admiral (Ret'd) Ken Summers, the former Commander CF Middle East during the 1990 Gulf War. These highly insightful and pointed assessments reinforce the fundamental need and critical lack in Canada's capability to deploy and support our forces in the world's littorals from their bases in Canada. Based at Shearwater, Nova Scotia, and employing a whole of government approach, the envisaged SCTF was to be comprised of navy, army, air, special operations, and representatives of key government department ready to deploy anywhere in the world with ten days notice. Indeed, the recent construction at Shearwater of a force headquarters building and the Minister of National Defence's wise decision on March 28 to regain a priceless strategic national asset by recovering Crown ownership of Shearwater's upper airfield and other lands that were previously sold to the Canada Lands Corporation gave every indication that the future of CEFCOM and the SCTF was assured. Implicit in past government's vision for a SCTF was the requirement to acquire one or more amphibious assault ships specifically designed for the embarkation and transportation of a militarily credible battle group comprised of 700-800 troops, their vehicles, weaponry other paraphernalia, and the enabling sea and air connectors. 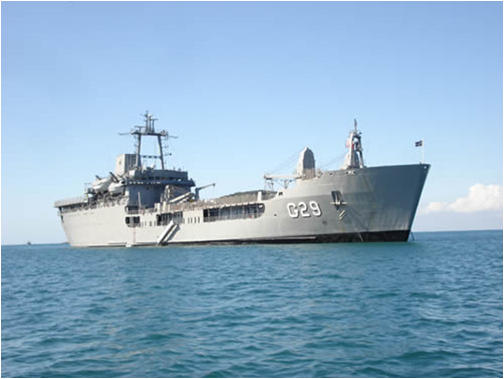 With no requirement for a sitting Prime Minister to secure prior air space or port clearances the SCTF's amphibious ships would afford political decision makers and military commanders unparallelled maximum flexibility and allow them the currently unavailable option of pre-positioning it in international waters in the vicinity of a gathering security crisis or an impending natural disaster. This joint seaborne quick reaction force was to have had an initial operating capability by 2007, but unforseen budgetary and operational pressures arising largely from our mission in Afghanistan obliged Mr. Harper's government to direct the former CDS, General Hillier, to suspend further development until after the 2010 Vancouver Olympics. At this time, according to the International Institute For Strategic Studies' publication: "The Military balance 2008," Canada's navy comprises a total of 47 ships: four SSK, three DDG, 12 FFG, 12 MCDV, two AOR eight YDT, and six TRG. Current plans call for: the commissioning of three JSS to replace the existing two AORs, the addition by 2010 of two more TRG vessels and up to eight Polar-class 5 Arctic Patrol Vessels; and starting in 2015, the construction of 15 ships to replace Canada's old Tribal Class destroyers (DDG) and its Halifax Class frigates (FFG). This could ultimately increase the fleet size to some 58 ships. Significantly, though, nowhere in the Canada First Defence Strategy is there any hint of any plans for the future construction of the additional amphibious warships that would be required by CEFCOM to enable it develop the previously envisaged SCTF amphibious capability. Numerical objectives and force capability requirements assume meaning only in the context of rigorous political and military assessments and approved programme goals, they do not validate the worth or relevance of a given strategy. They beg two larger issues: what political, economic, and security interests are Canadian naval forces intended to serve? And what is to be the navy's distinctive contribution to Canada's national security in this new century? It was thought that part of the answer would lie with the SCTF and its fully developed amphibious capability. Acknowledging that the Harper government is fully aware that in addition to its responsibility to adequately provide for the defence of our northern attic, carrying on with the transformation of our forces, and successfully pursuing to its successful conclusion Canada's current mission in Afghanistan, it must also be fully cognizant of its obligation to prepare our nation and its armed forces to respond to the rapidly evolving global geo strategic revolution that is now underway. In short, there will be wars to fight after Afghanistan and Canada must stand ready to carry its share of the West's burden. This is a change that is rapidly shifting North Americans' and Canadians' focus from Europe and the Atlantic Ocean to the vast reaches of the Pacific Ocean and peoples of the teeming nations of the Asia-Pacific littoral. This is where Canada's future prosperity lies. This is where Canada's future security challenges will arise. This is where Canada's future battles will be fought. This is where Canada's future body politic must be engaged. And this is where Canada's future military must be fully prepared to fight in the defence of Canada's national interests. Recognizing the importance of the burgeoning two way flows of people, commerce and natural resources between Canada and the Asia-Pacific Region implies that Canada, perforce, must turn its national face westward and significantly expand its now lilliputian diplomatic, intelligence, and military presence. To properly defend and advance Canada's interests in this vast area will require the use of all of its available instruments of national power. Soft power government initiatives underpinned by a standing military presence in the waters off our west coast and in the vast reaches of the Pacific Ocean will represent the nations' bulwark and help assure its continued security and prosperity. To adequately secure Canada's interest the nations' hard power elements must comprise a militarily credible surface, sub surface fleet, and a joint seaborne amphibious capability. For maximum efficiency and effectiveness this force must be fully interoperable with the armed forces of our closest allies in the region: the United States and Australia; the former possessing the world's most powerful navy and amphibious forces, the latter now swiftly moving to acquire its own modern amphibious capability through the acquisition of a new class of highly capable, minimally crewed and cost efficient amphibious warships. The sad reality of the apparent current situation with regard to the uncertain future of the SCTF, however, may well be that visionary efforts made under the former CDS to implant "jointness" within the CF may now be beginning to give way to much of the same old myopic, parochial and service-centric approaches to the nation's defence strategy that have so often failed Canada in the past. In this context our navy's long and continuing lack of purpose built expeditionary amphibious shipping to deliver and support security and humanitarian forces in the world's littorals at effective and viable levels is seen to represent a critical deficiency in military capability. It may also be that some politically compliant and newly minted admirals and generals may have failed to face up to the stark reality that the future JSS will have only very limited usefulness in supporting even small unopposed landings. Contrast this with the nation's amphibious capability that was so effectively demonstrated in 1956 during Operation Rapid Step by Canada's aircraft carrier, HMCS Magnificent, when it was quickly reconfigured for troop lift and speedily despatched by Prime Minister Lester B. Pearson in response to the United Nations request to send a peace keeping force to Egypt. Sadly such a national capability, was destroyed long ago with the scrapping of our last carrier, HMCS Bonaventure, in 1970. Since then we have seen the humiliating consequence of leasing civilian cargo ships and the GTS Katie incident and the gallant effort by the ships of Atlantic Command to deliver aid at New Orleans in the wake of Hurricane Katrina. So long as Parliament, the government of the day, and the Canadian Forces leadership, remain willing to accept that our nation's future strategic, political and military options will be unnecessarily reduced by the absence of a militarily credible seaborne joint expeditionary capability, Canada, in my opinion, will never live up to its full potential as an influential global middle power. In view of the geo political importance of this matter and its relationship to the future defence and well being of Canada and its peoples it is time for Mr. Harper to clearly state his government's intentions with regard to the future fielding of a SCTF with a militarily credible enabling amphibious capability. An early decision to join with the Australians and secure a Canadian equivalent to their new Canberra Class amphibious ships would be a positive and most welcome sign.